I consider this to be a fairly minimalist rig, and everything is very portable, which is great for travel. For all of my front-facing videos I am using a Panasonic Lumix LX7, and for some of my on-device and secondary camera angles, I use a GoPro Hero 3 Black Edition. The LX7 is my go-to camera for both photography and video work. 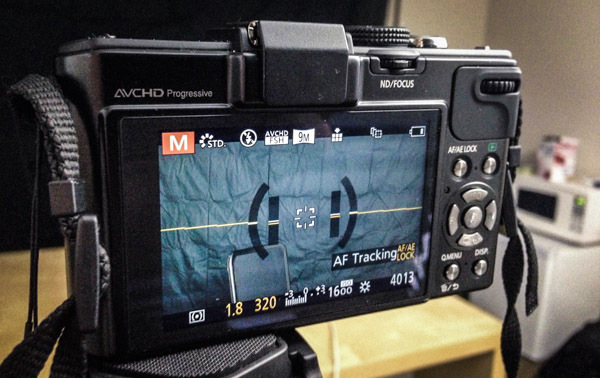 It captures great images, and allows for fully automatic or manual control of the image capture settings. When recording videos, I set the LX7 to manual mode so it won’t auto-focus or automatically adjust light balance, and I record everything in full HD (1080p, 30 FPS). On the GoPro, I normally select 1080p at either 30 or 60 FPS (depending on the situation and lighting). If I am outdoors, I’ll have Protune on, if I’m indoors I usually have Protune off. Camera settings are only part of the whole process. To have a decent output, you really need proper lighting, and a backdrop that isn’t distracting. I try to keep this setup very simple: I’ll place the camera on a tripod on the opposite side of my desk so that it faces me directly. Behind me, I’ll have a black muslin backdrop – this helps everything else stand out from the background, and it doesn’t reflect any light. Simple tip: Use a clothes steamer on the muslin backdrop, and the wrinkles will fall out pretty quickly. 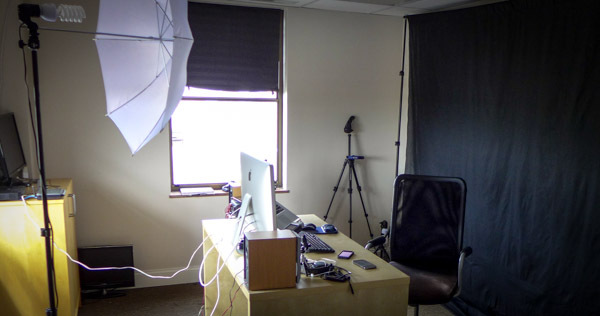 For lighting, I have darkening blinds that block out nearly all outside light – this way you can control the lighting for your video shoots. Often shooting a video may be done over several days, and I can’t rely on the weather and natural light to be consistent. With the room darkened, I normally use a single light source above and slightly off to the side of the camera. I try to find an angle that lights me up from the front, but does not reflect in my glasses. I also dim the display on my computer, so it’s not reflecting in my glasses, or dramatically altering the the lighting. Once the lighting has been set, I set up the camera and adjust zoom, focus, and aperture (exposure) where I want it for the current video. Great video is only half of the equation… Without clear audio, the videos aren’t nearly as good, and nobody wants to listen to bad audio. I started off using the built-in mics on my cameras, but quickly learned that the internal microphones weren’t going to cut it. 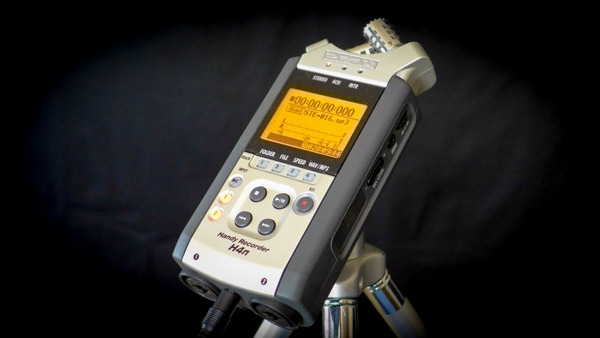 For all of my recent videos I’ver started using a Zoom H4N digital audio recorder. The Zoom enables high quality stereo recording. It’s very easy to use, and the recording quality is fantastic… now if only I could get those birds to stop chirping outside of my window. Capturing content is the first part of the process. The second part is editing everything together. In the editing process, I take advantage of all of the creative tools Adobe has to offer. Most of my video editing is done with Premiere Pro. This includes clipping & sequencing, color correction, effects, etc… All of my audio production is done with Adobe Audition – this includes sound cleanup, and mastering. For graphics, I use Photoshop and Illustrator, depending on the format and content. If you want to insert animations, you can even use Flash Pro as an animation platform, export as video, and pull it into your Premiere project. Once everything is how I want it, I’ll export to H.264 format (for the web), upload to YouTube, and then start syndicating it however possible/necessary. Normally, it’s just pulling in a YoutTube video into a blog post. thanks for sharing. A very well set up for video production. Do you connect the h4n to the lumix l7 via a cable?